In a large frying pan, brown the beef. Remove from the pan once cooked. Add the onion and pepper. Sauté for about 8 minutes until starting to brown on the edges. Add the garlic and cook 2 minutes. 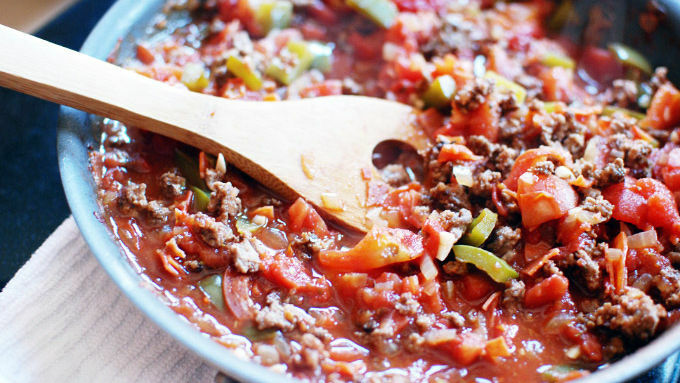 Add the canned tomatoes and stir. Add the oregano and simmer lightly for 10 minutes. Get your oven-safe bowls out and the biscuit dough ready. Flatten and stretch out each biscuit so it’s the same size as the rim of the bowl. Use a slotted spoon to divide the filling into the bowls, leaving some of the thin sauce for the top of the pizzas. Divide the cheese amongst the bowls, but save some for the top of the pizzas! Stir the cheese in. Top with the biscuits and press the edges of the dough right up against the rim of the bowl. Finally, top with your sauce, pepperoni, and cheese and bake for about 15 minutes until browned and fully cooked. Let sit for at least 5 minutes before serving. Top with a little more oregano. 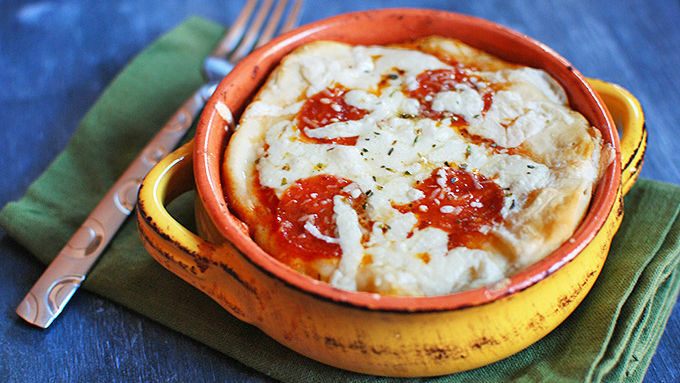 This pot pie not only has a pizza-flavored filling, but a whole mini pizza baked right on top. Pot pies are always fun, and this one’s got classic pizza flavors, but to take it to the next level, how about topping it with a mini pizza?! 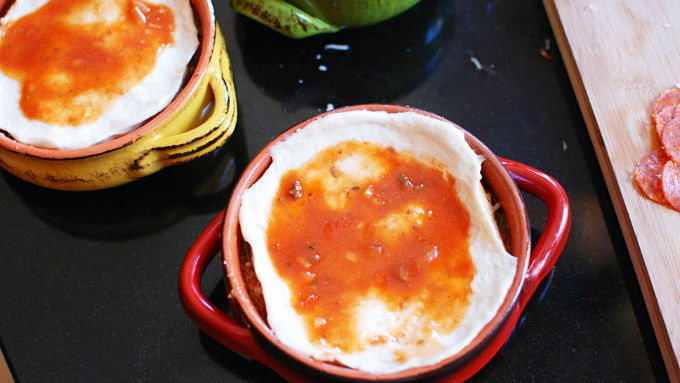 That’s the idea in these pizza-topped pot pies. It totally makes sense to do it this way, because you're already topping your pot pie with pizza dough. Might as well throw a few extra pizza toppings on there! It’s a really fun idea that almost creates an illusion in your head. You think it’s just a deep dish pizza at first, but then you start digging and find out the pizza is only skin deep – and the treasures that lie within are more like a thick pizza stew. These pot pies are fun and super easy to make, and would be a fun switch for your next pizza night! These were way tastier than I had expected! It was really fun diving deep into the pizza crust to get the piping hot filling on the inside. The meaty tomato sauce was great as a filling, but you could really go crazy with your favorite pizza toppings.